A bit ago, the glorious Trasi Kromer of Midwest Couture Blog turned me onto a photo-contest that I ultimately missed the date on (oops!) but she was wonderful enough to blog about the event and post my recipe! She’s honey-sweet, gorgeous & insightful so I hope you pay her blog a visit! Heat olive oil in pot or large sauce pan over low heat. (On the side, have a skillet heating slowly. Keep on low till 5 minutes before the Halibut step). Add diced onion, celery, fennel, tomatoes (and any stray tomato juice from dicing), garlic and cover immediately. Uncover after 3-4 minutes. When you see condensation droplets, that’s the sweat you want. Add salt to allow vegetables to release moisture, as well as Grains of Paradise (or pepper if unavailable), cumin, saffron (or azafran if unavailable), thyme and bay leaves. This delicate process we’re orchestrating is like a seasoning infusion. Cover to allow steam and precipitation to create a broth. Keep heat low and allow this process to work for an additional 5-6 minutes. Uncover and stir to assure there is no to minimal browning. Then, recover for an additional 2 minutes to ensure a good sweat has been had. 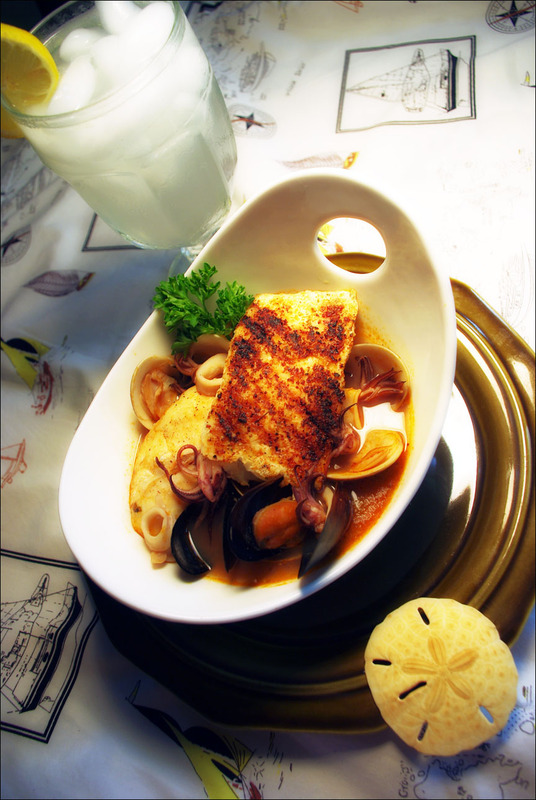 Uncover and Incorporate seafood stock & tomato sauce. Cover and let simmer for 10 minutes. Uncover and strain liquid. Discard or reserve solids for whatever you want to use them for. Up to you. For this particular recipe, we are creating a broth sans solids other than the seafood. Return liquid to sauce pan or pot. Add Orange Roughy and poach 6-8 minutes covered. Uncover and add squid. Poach an additional 2-4 minutes for a total of 2-4 minutes for the squid, 10-12 minutes for the fish. When done, remove fish and squid and cover with aluminum foil to stay warm. Add mussels and clams and cover. Do not disturb for about 8-10 minutes. Bring additional (hopefully) cast iron skillet up to med-high heat. You know it’s hot enough when you sprinkle water at it and the water beads off very fast and vanishes. This is essential because, if your skillet is not hot enough, your fish will stick. Must allow the protein to hit a hot surface and sear. No fat is necessary in the skillet when you sear. (No oil, butter, lard, etc). (Optionally, you can saute the Halibut in a fat for 3-5 minutes on each side if you are more comfortable with said cooking method). When skillet is hot enough, season Halibut with sea salt, Grains of Paradise (or pepper) and Herbes de Provence, (optional. There’s lavender in HdP which some people may find assertive). Sear each side 3-5 minutes. When done, set aside under aluminum foil to keep warm. When you uncover, all mussels and clams should be open. Discard any unopened ones as those have gone bad and may get you plague-sick. Time to plate! Ladel broth and shellfish in bowl. Wedge Orange Roughy in as best you can. Sprinkle squid. Wedge tentacles around, attractively. 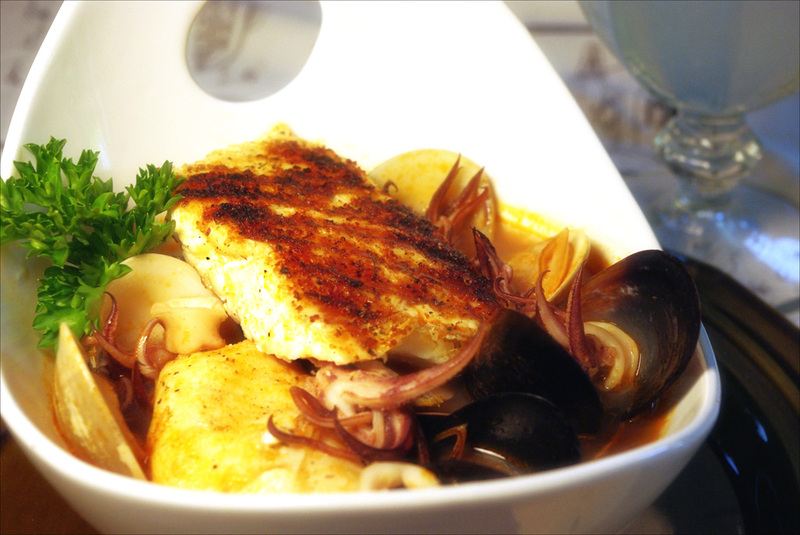 Top w/ seared Halibut and serve with crusty bread, (warm or toasty tortillas work, too!) & lemon wedges. Garnish with parsley. Serves 1-2. Increase ingredients according to how many you’ll be serving. Feel free to swap in various fishes and shellfishes to suit your tastes. This is a homely recipe where components are at your discretion. Technique and timing should be the focus in practicing this recipe. Subscribe to the Lounge Here!